You’ll find these books for sale on Amazon, at your nearest bookstore, or available for checkout at your city’s public library. For more information about a particular book, or to see its ordering information, click any book’s cover or title. Covers the Windows 10 April, 2018 update! Does Windows 10 and its gang of apps seem to change frequently? It’s because Microsoft updates Windows 10 twice a year; sometimes it updates its apps every week. My latest book, Windows 10 For Dummies, Third Edition, helps you figure out Windows 10’s latest batch of unpredictable changes, and it explains which features have been added, dropped, or simply moved someplace else. 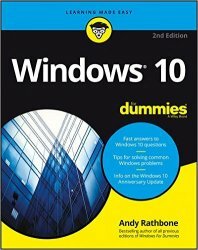 Windows 10 For Dummies, Third Edition is up-to-date with the many changes Microsoft has made to Windows 10 since its release in July, 2015. The book covers PCs, laptops and touchscreens. Updated for Windows 10’s Anniversary Update of August, 2016! Microsoft takes yet another shot at fixing Windows 8 and arrives at Windows 10. (Microsoft skipped Windows 9 to make people think their computers are way out of date.) Surprisingly, Windows 10 gets almost everything right. Windows 10 For Dummies helps you figure out Windows 10’s latest idiosyncrasies. You’ll find the book helpful whether you upgraded from an older Windows version or whether Windows 10 arrived on your new PC, laptop, or touchscreen tablet. This new, second edition includes all of the changes Microsoft has made to Windows 10 and its gang of apps during Windows 10’s first year of release. 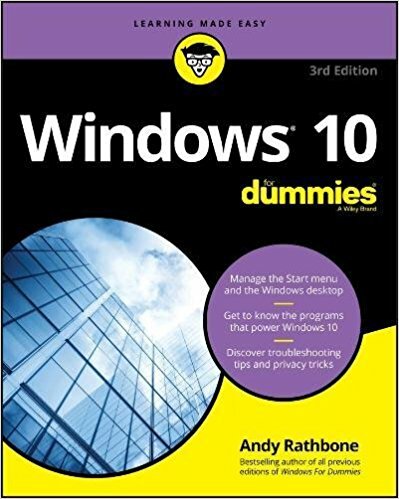 This bundle delivers a copy of the bestselling Windows 10 For Dummies book along with access to an online training course featuring three hours of online video instruction. Together, the package explains and demonstrates how to navigate Windows with a mouse or touchscreen, rearrange windows, store files, enhance Windows with applications, connect to the Internet, consolidate contact information, protect your privacy and security, customize the look of Windows, add user accounts, explore entertainment, and troubleshoot common problems. Stung by the criticism (and poor sales) of Windows 8, Microsoft applies a soothing balm of fixes in Windows 8.1. 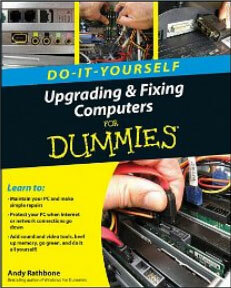 This book updates all of the step-by-step instructions found in Windows 8.1 and walks you through the improvements. Helpful tips let the PC owners stay on the desktop for as long as possible. The book also helps touchscreen owners stay on the Start screen, and avoid the desktop. This bargain bundle includes the complete Windows 8.1 For Dummies book plus a DVD that walks you visually through the most common Windows tasks. It covers all the upgrades that make up Window 8.1, including the new Start button. It also provides step-by-step instruction on getting started, using the start screen and the desktop, getting things done online, managing files, customizing Windows, and much more. 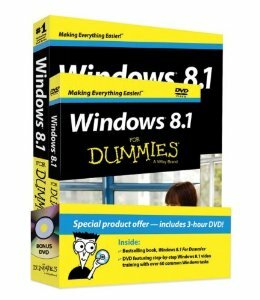 Windows 8.1 For Dummies Book + DVD Bundle is a value-priced crash course for anyone wanting to understand and use Windows 8.1. This second edition of Surface For Dummies covers the Surface 2, Surface Pro 2, Surface Pro, and Surface RT models. Surface for Dummies, 2nd Edition explains how Windows 8.1 Pro and Windows RT differ, and helps you decide which Surface model is best for you. Step by step, this book walks you through both the hardware and software features of the Surface, including the touch cover and type cover. Windows 8 may seem unwieldy on a desktop PC, but that’s because Microsoft designed it to run on a tablet. This book explains everything you need to know about using Windows 8 on a touch-screen devices, be it a tablet, laptop, or a yoga-like combination of the two. Microsoft’s Surface tablets bring the Windows tablet dream to the table. Finally, you have a tablet for checking e-mail, watching movies, viewing photos, and reading books during your leisure. And, when work calls, call up the Windows desktop to run Microsoft Office. This first edition of Surface For Dummies covers both the Surface RT and the Surface Pro tablets. Think you know how to use Windows? Forget all that hard-earned knowledge, because you probably won’t recognize Windows 8. Microsoft not only dropped the Start button from the desktop, they hid the desktop, as well. Windows 8 For Dummies helps you make the jarring transition to Windows 8’s new Start screen and its family of apps, both on desktop PCs and touchscreen tablets. And, should you hate the Start screen on your desktop PC, the book offers step-by-steps for bypassing the Start screen and camping out on the desktop, ensuring that Windows 8 behaves much like earlier Windows versions. It’s no surprise that CNET granted the Xoom one of the coveted “CES 2011 Best of Show” awards. First out the gate, the Motorola Xoom boasts solid hardware, just waiting for the free updates coming down the road: 4G cellular access, and expansion to 64GB of storage. The Motorola Xoom tablet plays Flash videos, shoots photos and videos from its front-and-rear-facing cameras, and displays it all on a large, high-resolution screen. This full-color book explains everything you need to know about both the Wi-Fi-only and 3G/4G models of Xoom. It includes coverage of the Android 3.1 update released in May. Be the envy of your friends with these easy-to-follow, step-by-step, illustrated instructions for upgrading your computer. Replace any drive, beef up your video, salvage an old PC’s parts, or add more power to your tiny netbook – all by yourself. Discover how to find the parts you need at the best price, avoiding lemons along the way. The latest edition of the bestselling computer book of all time explains Microsoft’s newest Windows version, Windows 7. Compared with Windows Vista, it’s a dream! Completely rewritten to cover the most frequent computer upgrades including memory, hard drives and installing Windows Vista, this new edition shows how the Internet and Vista’s new troubleshooting tools can solve your computer problems. This book has the latest information on Windows Vista, the version installed on almost all PCs from late-2006 to mid-2009. This book covers everything you ever wanted to do with your PC, and everything that plugs into it: Scanners, monitors, digital cameras, music players, camcorders, TV sets, keyboards, mice, sound boxes and other gadgetry. Still clinging to Windows XP? The second edition of Windows XP For Dummies keeps your grip tight.